Oh my, what a weekend. It was my first back home after lots of travelling, and my roommates were all out of town, leaving a big, echo-y house to settle back into. So I slept. Did the laundry. Mopped the floors. 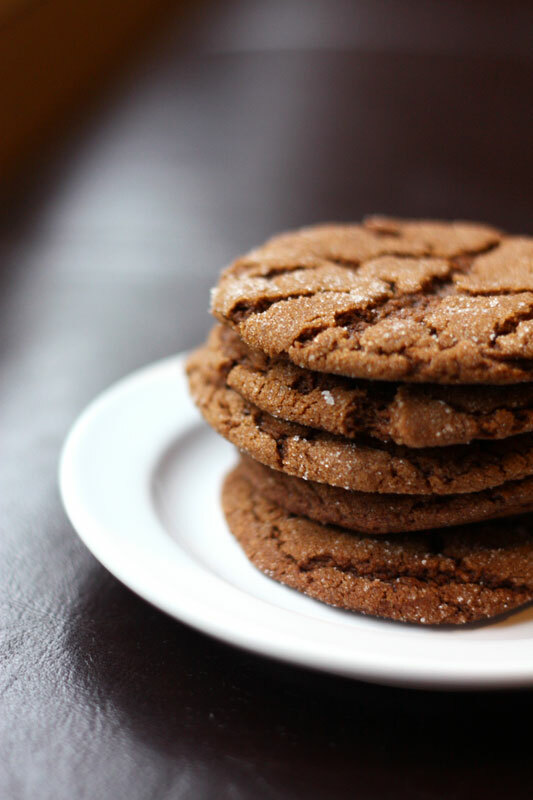 Made molasses spice cookies. That last one was probably the highlight. I was a little reluctant to make these at first, as they just seem like a very fall-appropriate recipe, and I refuse to give up on summer any earlier than I have to. But it was rainy and I wanted something toasty, and it turns out that these cookies are perfect. They’re soft and chewy with a slightly crisp outside, and even though the molasses makes the dough taste pretty iffy, once they’re baked it all balances out and they end up spicy and sweet and wonderful. The icky dough is probably actually a good thing, since this may be the first time I managed to get as many cookies out of the recipe as I was meant to. They definitely evoke fall, but in a comforting way, and it’s only August so I don’t even really need to worry yet – I have months of summer left! Months! Please don’t tell me otherwise. Yield: about 20 large cookies. In a medium bowl, mix together flour, baking soda, salt, cinnamon, ginger, cloves, and allspice and set aside. Beat the butter with an electric mixer for 2 minutes. Add the brown sugar, and 1/2 cup granulated sugar and beat until light and fluffy, about 3 minutes with mixer set at medium speed. Add egg, vanilla extract, and molasses. Beat until combined, about 30 seconds. Scrape down sides of bowl with a rubber spatula. Add dry ingredients and beat at low speed until just combined, about 30 seconds. Place remaining 1/3 cup of granulated sugar in a shallow bowl. Scoop out dough in 2 tablespoon clumps and roll into 1 3/4 inch-wide balls. Roll balls in sugar and place on prepared sheets, spacing them 1 1/2 to 2 inches apart. Bake until the outer edges of the cookies begin to set and centers are soft and puffy (the inside of the cracks will still look raw), about 11 to 13 minutes. Don’t overbake these cookies! Cool cookies on sheets for 5 minutes, then transfer to wire racks. 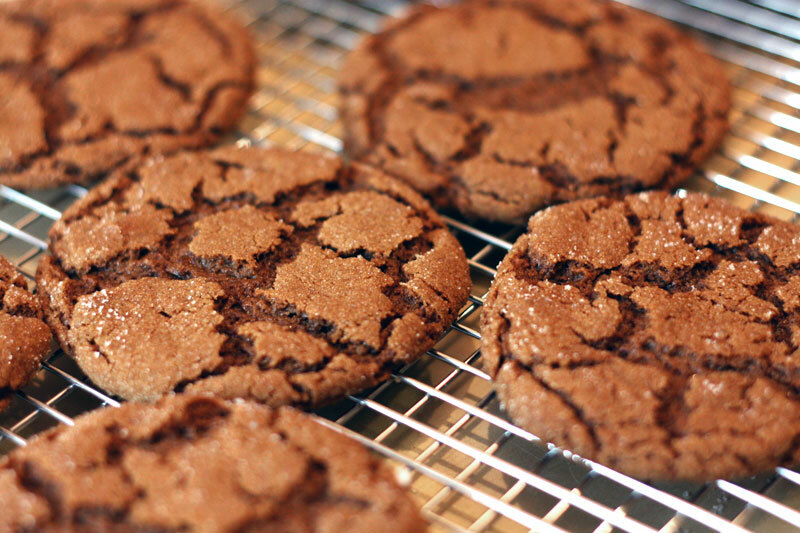 These cookies stay nicely chewy for a few days if kept in an airtight container. Ooh, these look gorgeous! I will try them soon! I make these every Christmas (and rest of the year)! They are my favorite cookies and yours are beautiful with the cracks and sugar “sparkles”. Soft and chewy, now that’s my type of cookie! I love these cookies! I’ve been making them since I was kid. They’re probably my favorite cookies next to chocolate chip. They’re a great fall/winter cookie, I’ll have to make some soon! musingsat – I don’t really like overly sweet baked goods and I thought these were really good. I’d actually advise against decreasing the sugar in this recipe because it would probably affect the texture of the cookie. 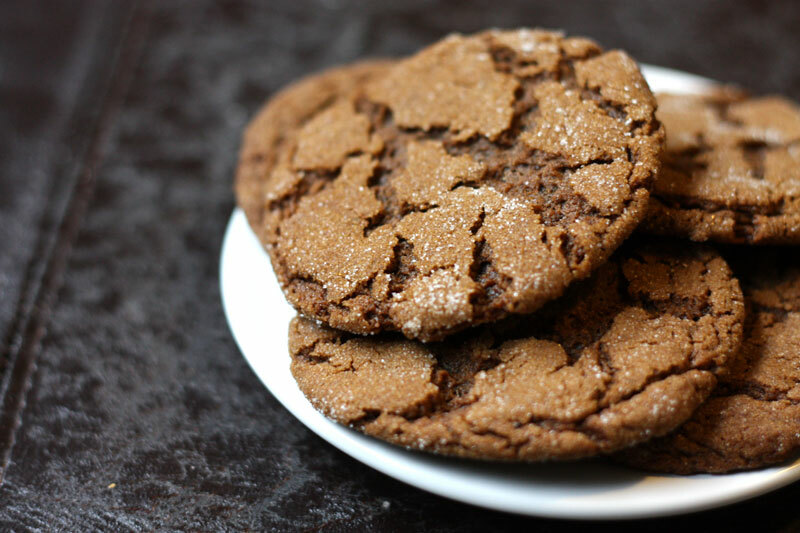 I think even though molasses is sweet, it balances well with the spices and stronger flavours. hope that helps! You are currently reading rainy day cookies at one cake two cake.